June 26 – The first bloodshed of the Texas Revolution takes place at Velasco when Texans, transporting a cannon from Brazoria to Anahuac, are challenged by Mexican forces at Velasco. The Mexicans surrender on June 29. Oct. 2 – Mexican troops attempt to retrieve a cannon that had been given to Gonzales colonists for protection from Indian attack. The skirmish that ensues as Gonzales residents dare the Mexicans to "come and take it" is considered the opening battle of the Texas Revolution. Oct. 10 – Gail Borden begins publishing the newspaper "Telegraph and Texas Register" at San Felipe de Austin. Nov. 1 – A "consultation" convenes at San Felipe; on Nov. 7 the delegates agree to establish a provisional government. Nov. 24 – The Texas Rangers organization is officially established by Texas' provisional government. Although Stephen F. Austin had hired 10 frontiersmen as "rangers" to help protect his colonists against Indian raids in 1823, not until 1835 was the law-enforcement group formally organized. March 2 – The Texas Declaration of Independence is adopted at Washington-on-the-Brazos. 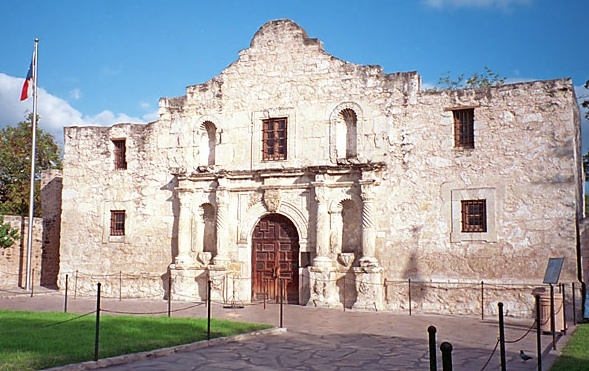 March 6 – A 13-day siege of the Alamo by Mexican troops led by Gen. Antonio López de Santa Anna ends on this day with a battle in which all remaining defenders are killed. March 10 – Sam Houston abandons Gonzales and retreats eastward to avoid the advancing Mexican army. Panicky settlers in the area flee as well in an exodus called the Runaway Scrape. March 27 – About 350 Texan prisoners, including their commander James Fannin, are executed at Goliad by order of Santa Anna. An estimated 30 Texans escape. April 21 – In a battle starting about 4:30 p.m. and lasting 18 minutes, Texan troops led by Sam Houston defeat the Mexican army commanded by Santa Anna at San Jacinto near present-day Houston. Houston reports that 630 Mexican troops were killed and 730 were taken prisoner. Of the Texas troops, nine of a force of 910 were killed or mortally wounded, and 30 were less seriously wounded. May 14 – Santa Anna and Texas' provisional president David Burnet sign two Treaties of Velasco – one public, the other secret – ending the Texas Revolution. The treaties were, however, violated by both sides. Texas' independence was not recognized by Mexico and Texas' boundary was not determined until the Treaty of Guadalupe Hidalgo, which ended the Mexican War, was signed in 1848. Sept. 5 – Voters of the new republic choose their first elected officials: Sam Houston becomes president and Lorenzo de Zavala, vice president. The voters also overwhelmingly approve a referendum requesting annexation by the United States. U.S. President Martin Van Buren refuses to consider it, however, citing fear of war with Mexico and constitutional scruples. Oct. – The first Congress of the Republic of Texas convenes at Columbia. The Republic of Texas is officially recognized by the United States, and later by France, England, the Netherlands and Belgium. Aug. 1 – The first sale of town lots in the new capital of the Republic, which is named for Stephen F. Austin, is held. March 19 – Comanches, led by a dozen chiefs, meet with officials of Texas government to negotiate a peace treaty. Believing the Comanches to have reneged on a promise to release all white prisoners, the Texans take the chiefs prisoner. During the Council House fight that follows, 35 Comanches are killed, as are seven Texans. Aug. 5 – Near Hallettsville, a large band of Comanches, in retaliation for the Council House Fight, begin killing and looting their way across Central Texas. Texas Rangers and a volunteer army defeat the Comanches on Aug. 11 at Plum Creek near Lockhart. June 20 – The Santa Fé Expedition, launched without Texas Congressional authorization by Pres. Mirabeau B. Lamar, leaves Central Texas on its way west to establish trade with and solidify Texas' claims to territory around Santa Fé. Members of group are taken prisoner by Mexican troops, marched to Mexico City and imprisoned. They are finally released in 1842. The first seeds of large-scale German immigration to Texas are sown when a German society, the Adelsverein, purchases land for settlements in Central Texas. (Right) Important events and dates in the history of Texas. 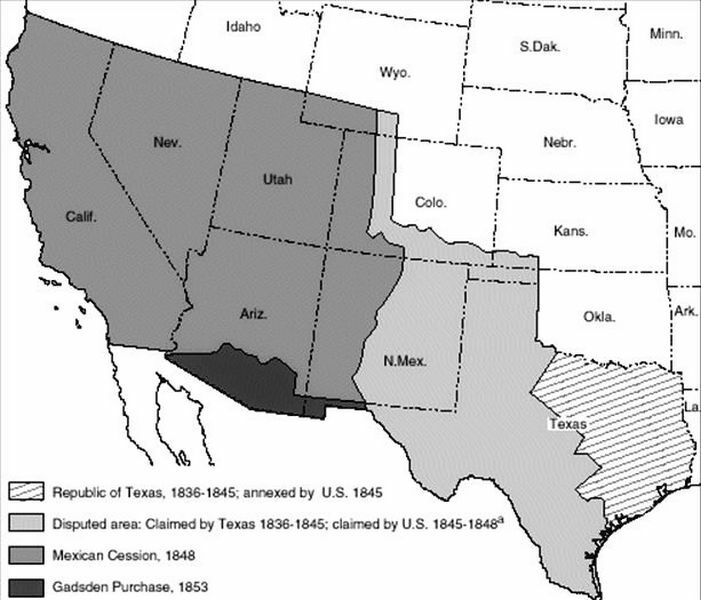 March 1 – U.S. Congress passes a "Joint Resolution for Annexing Texas to the United States." mid-March – The first of many large groups of Germans arrive in Central Texas, settling at New Braunfels. 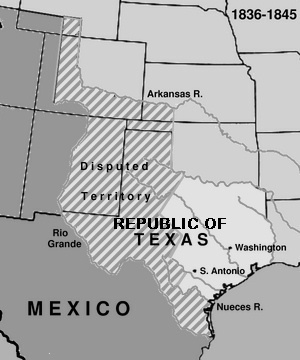 July 4 – The Texas Constitutional Convention votes to accept the United States annexation proposal; it drafts an Annexation Ordinance and State Constitution to submit to the voters of Texas. Oct. 13 – Texas voters overwhelmingly approve annexation, the new state constitution and the annexation ordinance. Dec. 29 – The U.S. Congress approves, and President James K. Polk signs, the "Joint Resolution for the Admission of the State of Texas into the Union." Texas becomes the 28th state. Feb. 19 – Although Texas officially became a state on Dec. 29, 1845, the formal transfer of government does not take place until this date. May 8 – The Battle of Palo Alto near Brownsville is the first major battle of the two-year Mexican War. Feb. 2 – The Treaty of Guadalupe Hidalgo is signed, ending the War with Mexico and specifying the location of the international boundary. Feb. 11 – The first railroad to actually begin operation in Texas is chartered by the state government. The Buffalo Bayou, Brazos and Colorado begins operation in 1853. Nov. 25 – Texas' governor signs the Compromise of 1850, in which Texas gives up its claim to land that includes more than half of what is now New Mexico, about a third of Colorado, a corner of Kansas, the Oklahoma Panhandle, and a small portion of Wyoming in exchange for the United States' assumption of $10 million in debt; Texas keeps its public lands.